The first half of the forecast period will prove to be moderately challenging for the dental membrane and bone graft substitutes market owing to the fact that products by several companies will have reached a phase of maturity. However, by 2020, new products and materials are expected to enter the market, presenting strong scope for future growth. 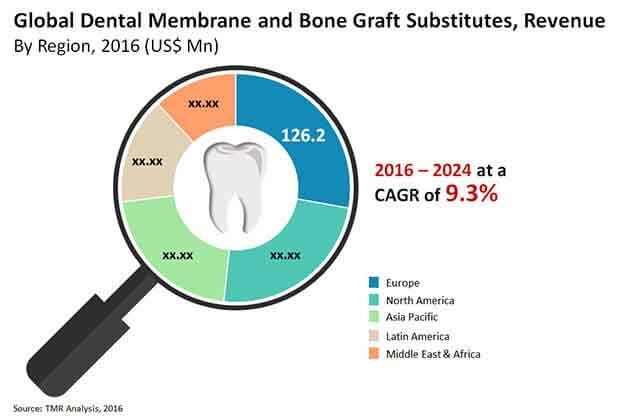 Exhibiting a strong CAGR of 9.3% during the forecast period, the dental membrane and bone graft substitutes market is expected to rise from a value of US$419 mn in 2015 to US$922.6 mn by 2024. Based on product, the global market has been bifurcated into dental membrane and bone graft substitutes. Bone graft substitutes account for the dominant share in the market. Within this segment, allograft holds a strong position owing to easily acceptance by the body and its biocompatibility. Resorbable membranes take the lead in the dental membranes market. Dental clinics are the leading end users of dental membranes and bone graft substitutes, accounting for a 50.9% share by 2024. Dental clinics are convenient, easy to access, and are preferred by patients for minor dental problems. This is expected to enable the segment to register a high growth rate by the end of 2024. By material, the dental membrane and bone graft substitutes market is segmented into hydrogel, collagen, polytetrafluoroethylene (PTFE), human cells source, other species, hydroxyapatite (HA), and tricalcium phosphate (TCP). Human cells sources hold the dominant share with an estimate share of 56.0% in 2015. Europe dominates the global dental membrane and bone graft substitutes market, with a share of 27.8% in 2016. Rapid innovation in technology, increasing geriatric population, and high R&D expenditure are attributed to the growth of this market. According to the European Federation of Periodontology, around 30% of the population in Europe suffers from periodontal disease. These factors collectively drive the dental membrane and bone graft substitutes market in the region. North America is also a key market for dental membrane and bone graft substitutes. According to the American Academy of Periodontology, approximately 64.7 million Americans have periodontitis. The region also has the highest prevalence of dental diseases among children, which presents an increase in the number of patients requiring dental treatment. This, in turn, drives the demand for dental membrane and bone graft substitutes. Asia Pacific is anticipated to exhibit strong growth in the coming years. According to the UN, Japan has the highest geriatric population. Older people have a higher susceptibility to dental diseases, which is likely to increase the demand for dental membrane and bone graft substitutes. Growing awareness regarding oral health in countries such as China and India is also likely to support APAC market. Key companies in the dental membrane and bone graft substitutes market include Geistlich Holding, Zimmer Dental Inc., Integra LifeSciences Corp, DENTSPLY Implants, Institut Straumann AG, BioHorizons IPH, Inc., Osteogenics Biomedical, Nobel Biocare, Implant Direct LLC., Collagen Matrix, NovaBone India, and Maxigen Biotech Inc. Dental membrane and bone graft substitutes is used in the bone graft surgeries. Bone graft surgery is required when tooth is lost by accidents, dental disease and old age. According to WHO, Globally, about 30% of people aged 65–74 have no natural teeth and Across the world, 16-40% of children in the age range 6 to12 years old are affected by dental trauma due to unsafe playgrounds, unsafe schools, road accidents, or violence. Moreover, According to the American Academy of Periodontology, approximately 64.7 million Americans have periodontitis. Thus, market is tend rise rapidly during forecasted period as number of oral and dental disease patient is increasing. This report on the global dental membrane and bone graft substitutes market analyzes the current and future prospects of the market. The report comprises an elaborate executive summary, including a market snapshot that provides overall information of various segments and sub-segments. The research is a combination of primary and secondary research. Detailed qualitative analysis of factors responsible for driving and restraining market growth and opportunities has been provided in the market overview section. Market revenue in terms of US$ Mn for the period between 2014 and 2024 along with the compound annual growth rate (CAGR %) from 2016 to 2024 are provided for all the segments, considering 2015 as the base year. Market related factors such as technological developments, recent products approvals, investment in clinical studies and acquisitions by leading players in the market, and historical year-on-year growth have been taken into consideration while estimating the market size. Growth rates for each segment within the dental membrane and bone graft substitutes market have been determined after a thorough analysis of past trends, demographics, future trends, technological developments, product development life cycle, and regulatory requirements. These factors would help the market players to take strategic decisions in order to strengthen their positions and expand their share in the dental membrane and bone graft substitutes market. Based on material, the dental membrane and bone graft substitutes market has been segmented into hydrogel, collagen, polytetrafluoroethylene (PTFE), human cells source, other species, hydroxyapatite (HA), tricalcium phosphate (TCP). Geographically, the dental membrane and bone graft substitutes market has been segmented into five regions: the North America, Europe, Asia Pacific, Latin America and Middle East and Africa. These region have been further segmented by product, by material, by end user and by country. The competition matrix section included in the report is likely to assist the existing players to increase their market shares and new companies to establish their presence in the dental membrane and bone graft substitutes market. The report also profiles major players in the market based on various attributes such as company overview, financial overview, SWOT analysis, key business strategies, product portfolio, and recent developments. Key companies profiled in the report include Geistlich Holding, Zimmer Dental Inc., Integra LifeSciences Corp, DENTSPLY Implants, Institut Straumann AG, BioHorizons IPH, Inc., Osteogenics Biomedical, Nobel Biocare, Implant Direct LLC., Collagen Matrix, NovaBone India and Maxigen Biotech Inc.